René Prou (1889 – 1948), born in nates and educated in Paris, was a decorator and a furniture designer. He studied at the Ecole Bernard-Palissy in Paris and shortly after became the design house Gouffe's chief designer and being called the first decorator of the modern taste (gout moderne). He contributed to the Art Deco movement's expansion. In 1926, he participated to the luxurious decoration of the Orient Express's Pullman Cars to which he applied rare wooden marquetries and precious Chinese lacquers. Fuelled by classical forms, he nevertheless contributed to modern design by participating to the decoration of various ocean liners and the Villa Noailles. René Prou (1889-1947), set of six sofas, circa 1950, France. 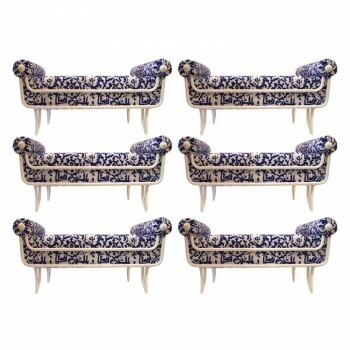 René Prou (1889-1947), Set of six sofas, White lacquered iron, fabric and wood, Circa 1950, France. Height: 63 cm, seat height: 50 cm, Width: 1m23, depth: 67 cm.